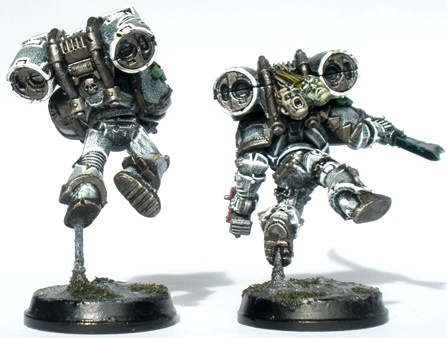 Some of my old 40k stuff today. 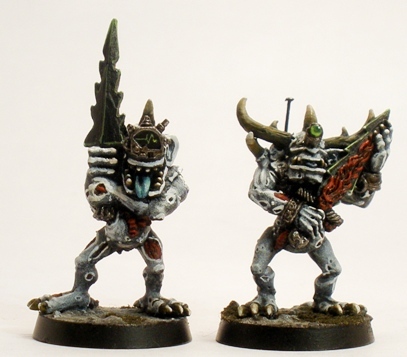 Plaguebearer Nurgle daemons. 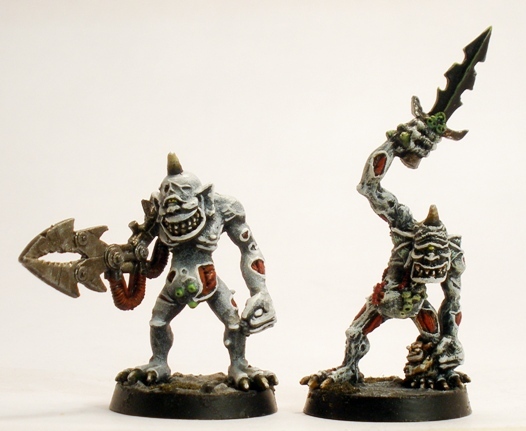 Plaguebearers are Nurgles tallymen, embodying the futility of mortal existence by constantly making lists and categorising myriad life matters which cannot be measured. Just like me. 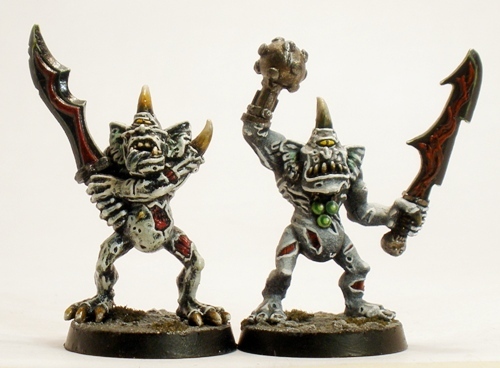 Plaguebearers all bear the signs of rot and decay in addition to monocular vision and a horn (occasionally more than one). 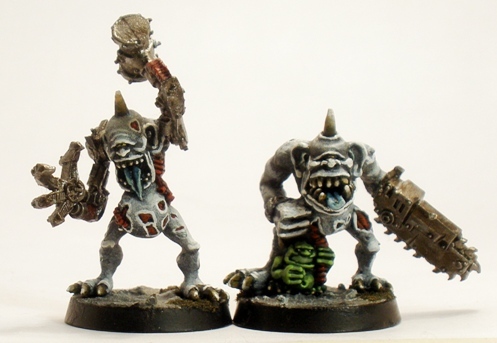 Usually they are portrayed in brownish greens, like everything Nurgle tends to be. 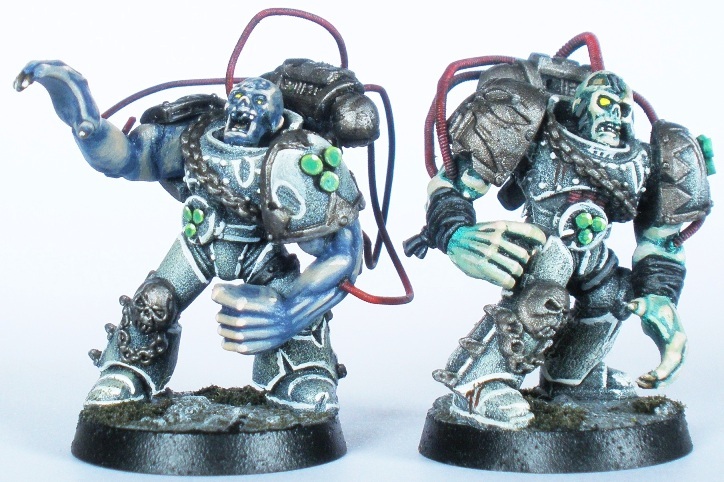 I broke from the norm and chose to tie my plaguebearers colour scheme to my Sin Eaters marines. 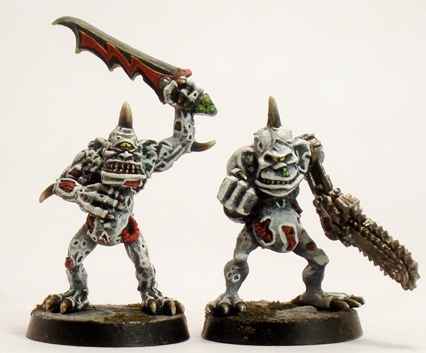 In that era 40k daemons were summoned into play, popping into existence when certain game criteria are reached (its probably done similarly in current 40k, but I dont know for sure). 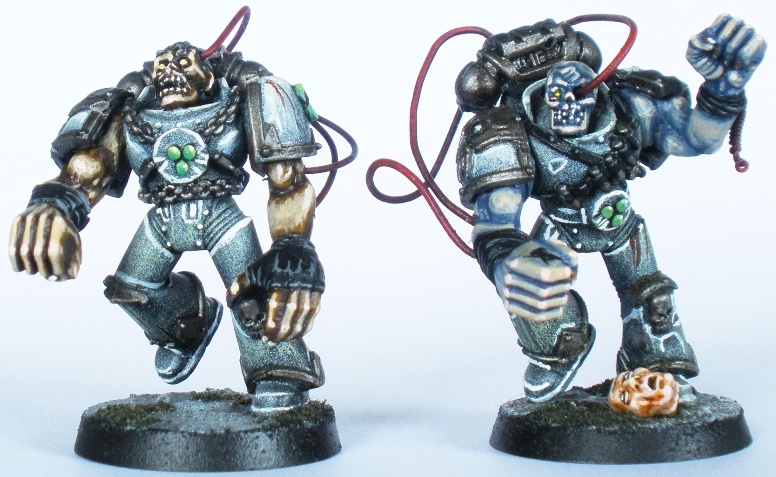 In an effort to make my figures unique and to tie them into sci-fi rather than fantasy Warhammer I added cybernetic elements to a number of the figures. Conceptually I see those as bits of junk that coalesce into usable forms along with the daemon itself (being unliving embodiments of decay and all that). If you imagine Tetsuo fusing with surrounding mechanical objects towards the end of Akira then you are on the right track. Mainly I did it because I thought that it would be a fun project to make some goofy demon figures into cyborgs, ’cause I like cyborgs more than demons. 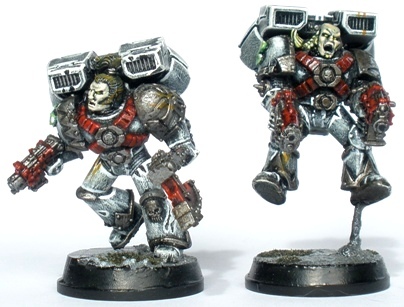 The figures are a mix of six of the original plaguebearers from the eighties, plus four of the nineties guys. It is easy enough to tell which are which I think. 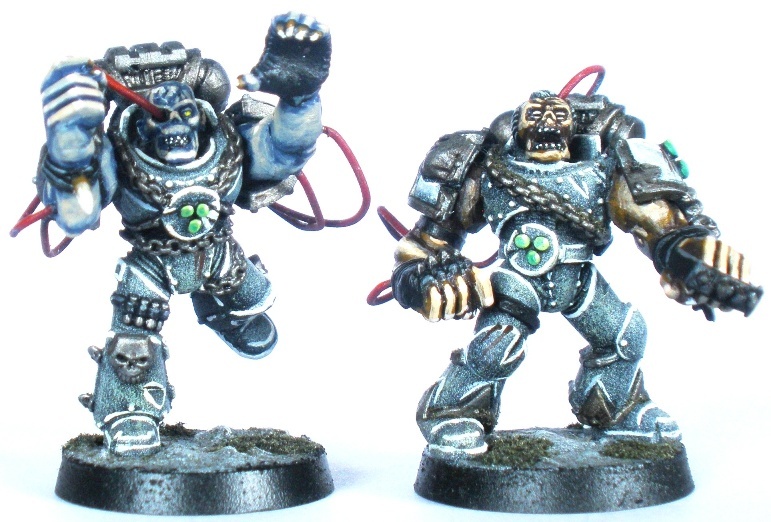 The cyborg weapon elements are all Necromunda Pit Slave parts, plus an old Warlord titan chainfist. My favourite pair of these goofy freaks are shown in the first and final photo. One guy has had his eye replaced with the screen from an Imperial auspex, complete with EEG style readout. He also had a piece from a radar dish glued to his back. The other guy has a rifle sight in place of his eye. He also has a backpack with an aerial and a Nurgle symbol on it. Far out. The paint job is quite cartoony, aided and abetted by the comical sculpts and ludicrous bionics. 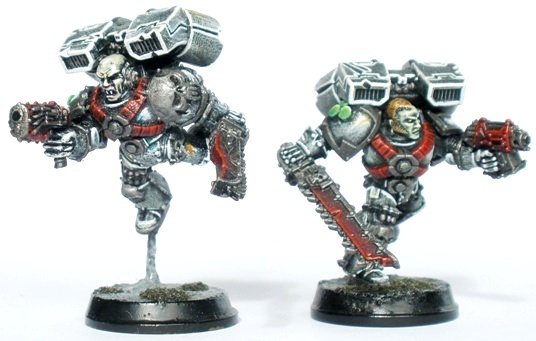 I like the look, even though they might jar a little with some more “serious” looking 40k figures (although at the time of writing Space Wolves mounted on wolves from space have just been released and even they are not as silly looking as the preposterously poorly conceived Dreadknight). 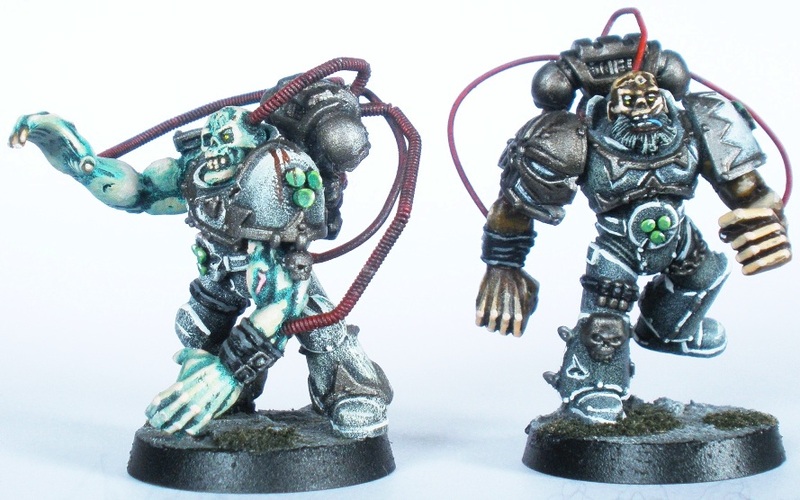 The plaguebearers have featured in very few games. I once used them in a day long mini campaign and then in casual home games a couple of times. They were always lacklustre in rules terms in those days. I plan to use them for some skirmish games using Inquisitorial retinues and the like at some stage, hopefully during the next couple of years. 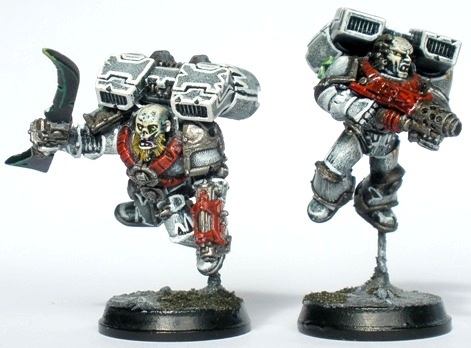 I might have them lead by Judge Mortis some time too: I can see Dredd Hi-Ex-ing a few of these guys.